I have posted this recipe before but have been working on it and I think I improved on it. 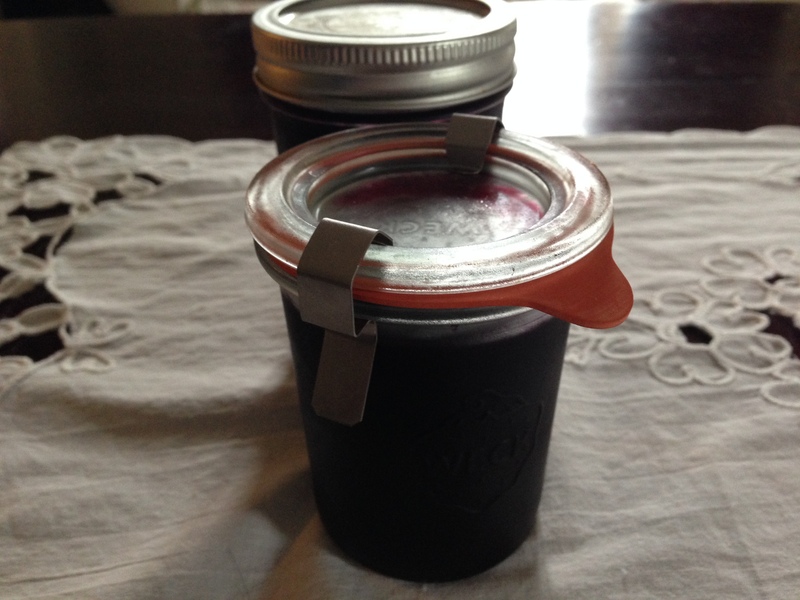 I found concord grapes last weekend at the farmers market and was immediately so excited, I love concord grape jam and had used my last jar from the batch I made last year. Honestly, a PB&J with this jam is amazing. I use less sugar than called for in the original recipe and use an apple with all of its’ pectin to help set this jam. It has a robust concord grape flavor, it’s not too sweet (just right in my opinion) and spreads like a dream. Place the liquid back in the saucepan add the apple and simmer on medium for about 20 minutes or until apple is soft, remove apple. Pour into sterilized jars, screw lids on tightly and let sit until it reaches room temperature. It will become very thick, you know, like jam. 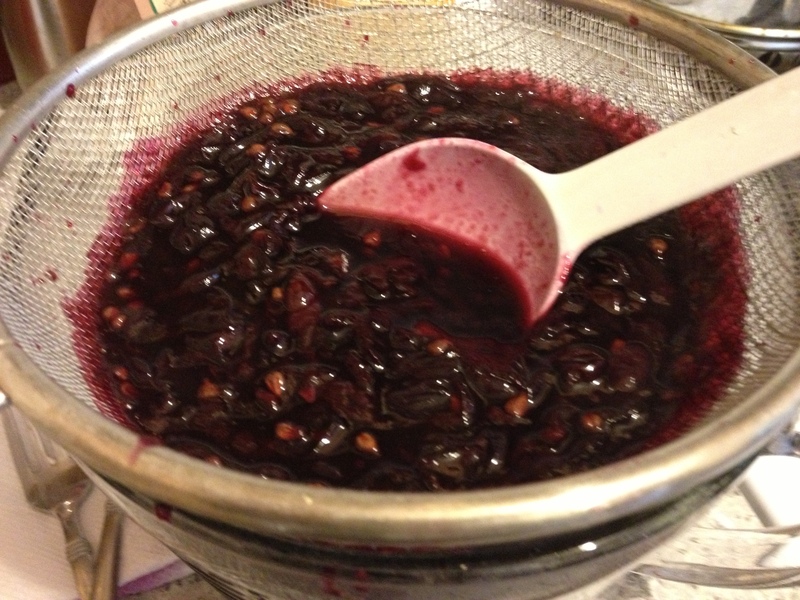 Or if you have the equipment and know what you are doing you can process or preserve the jam. I added to sterilized jars pouring hot jam in them and they sealed but it’s not a good strong seal so I store in the refrigerator and it kept for several months unopened. ← Happy Halloween!! Awesome Salsa Giveaway- The Winner is……. Thank you, it’s really good. I am a big lover of jam, jelly and preserves. It works so well, the jam is perfectly set and so delicious! Thank you so much. Thank you, the bumble bee cup is my fave, it was a gift from a wonderful cook I know in Texas. 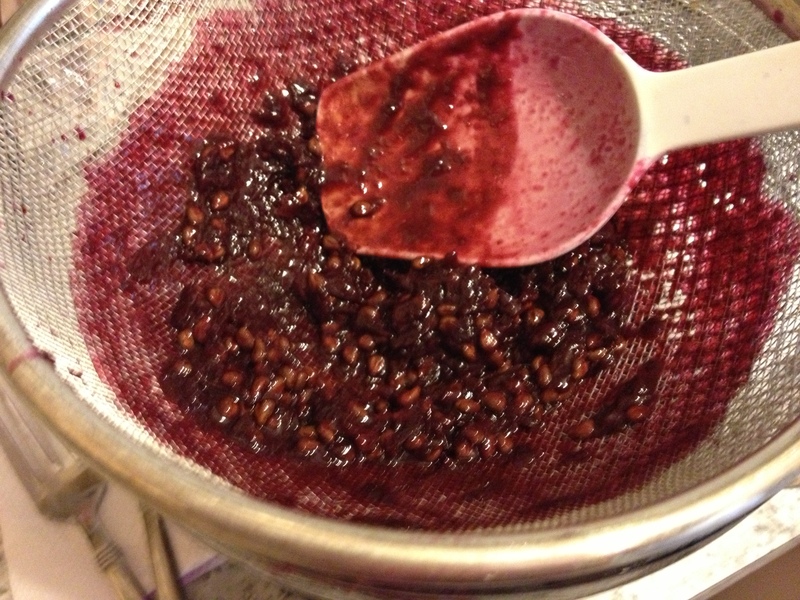 The jam is easy, just be sure that it is cooked long enough so that it thickens nicely. You can test by dropping a small amount on a saucer, it should not run around the plate but be thick. There is nothing like home made jam, it’s so good. There really is nothing like homemade jam. How lucky you are to have grapes. This recipe is really easy and so good, very intense grape flavor. Thanks so much. Thanks for sharing. I love this recipe. Concord grapes are so delicious – but hard to eat because of the seeds. Jam is the answer. Pinning this great recipe NOW. I know, I have to figure out how to add pinterest, twitter etc… thanks though. I can help you! Just shoot me any email and I can walk you through it. I am self-taught and wish someone would have shown me the ins-and-outs of wordpress. Yep, making into jam takes care of the seeds for sure. Thank you so much! 🙂 Thank YOU for sharing… PugInTheKitchen. LOVE that name! I’ve wondered what to call it I didn’t call it jelly because it does contain pulp albeit seived, whatever it is called it’s delicious!! Yes and like your pear and grape it’s pretty heavenly. I love warm toasted bread with butter and jam and a cup of coffee or tea. It’s dangerous!! You’re right, if it contains pulp it would be jam. And I did check out PB&J just now. Of course! Still can’t do peanut butter, even though I love peanuts. Must do that soup! Are you allergic to peanuts, can you do almonds? I often make almond butter and have that on bread with jam. YUM!! I’m on the lookout for some concord grapes now! I was out earlyish, normally have just a handful of kids come I buy a small amount of candy and have leftovers, this year there were hoards and masses and all my candy went in less than an hour so we went inside for fear of being tricked since I was out of treats. The pugs were in costume, Izzy was a fairy and Nando a pirate, they were not amused. The colour in this jam is absolutely glorious! I bet it’s delish! It’s absolutely delicious, and the color is so vivid and beautiful. Thank you! 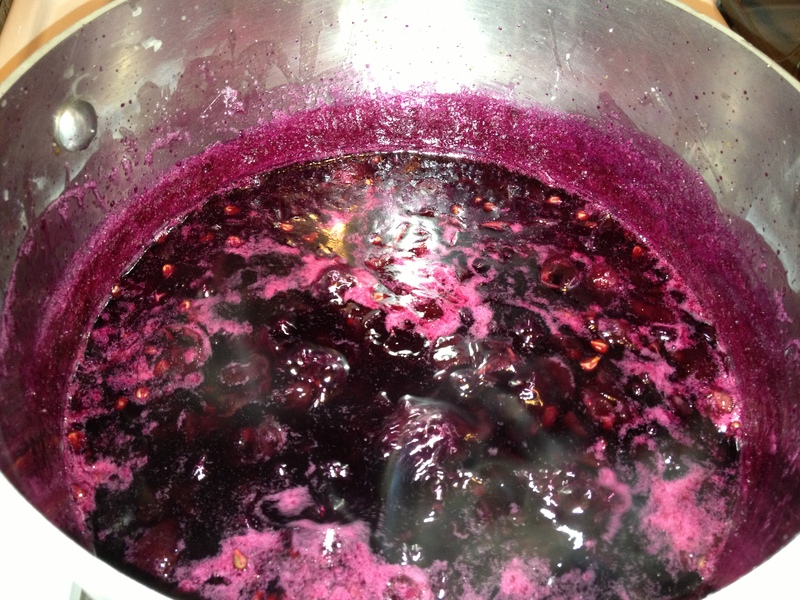 This jam looks beautiful Suzanne – how is it that over this many years, I’ve never tried grape jam before?! I’ll have to google ‘concord grapes’ to find out what would be similar here in Oz and give it a try. I wonder in Australia if you have concords, I look forward to them every year. They make the most glorious jam and juice. Hope you can find them. Totally worth the effort. Thanks so much. 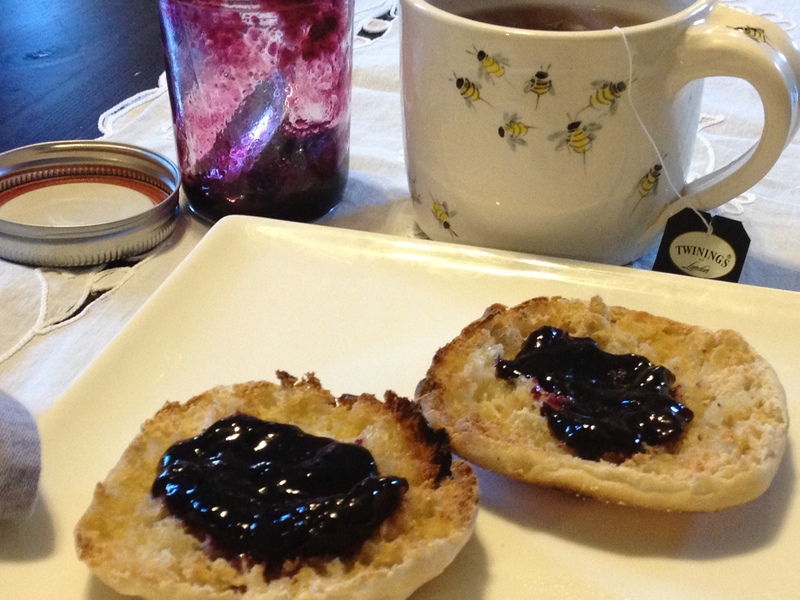 I love the purple jam, usually I make my own jam with my own apple pectin more than to buy one from the store. What is the concord grapes, I wonder we have any in England? Concord is just a type of grape like green or red or black grapes. They are quite popular in the US not sure if they are grown elsewhere. If they are though I suggest you give them a try, they are unique in flavor and make a tremendous jam and juice. Thank you so much. I looked up concord grapes on wikipedia and it seems they are most likely indigenous to the US but hope you can find them in England. If you can’t I wish I could send you a jar!! Myles loves Concord grapes and once asked me if I could make Concord grape ice cream. I looked high and low for them, but couldn’t find any out here in CA. But when I was living in Massachusetts, they were mainstream. I’d love to make this jam if I can find some here. Using an apple is a great way to add pectin when you need it! It’s funny I thought you would be able to get concord grapes all over the US, maybe there are certain climates they don’t do well in. I just love them and get very excited when I see them at the farmers market. I am going again on Saturday to see if they have any more. I plan on making another batch of jam and maybe some juice. They are just so wonderful. Yes, the apple does wonders, because I don’t add the prescribed amount of sugar and don’t want to cook all day I use the apple and it really is amazing. Thanks so much Susan. Oh wow, how I wish I had a jar of this in my fridge! I saw some concord grapes that the market last week, and almost just picked them up on a whim, but didn’t really know what I would do with them. I don’t really know anything about canning and preserving. But did I understand correctly that this keeps 2 months in the fridge? Yes, it actually kept longer in my fridge. I sterilize the jars, pour the liquid in hot and it self seals. I let cool at room temp and then refrigerate. They actually lasted a long time for me closer to 6 months but thats not advised of course. I don’t do a proper preserving I just don’t have the equipment to do so. It really is delicious and I actually heard the pop of the lid which means there is some sort of seal. Oh wow, that’s a a really long time! Excellent. Buying those grapes next time I see them! It really is but I am very careful to sterilize the jars, I make sure I fill them up with the correct amount and make sure the jam is hot off the stove and seal them immediately. I basically follow all the rules of canning except for the water bath which I suspect I will do soon as soon as I get the equipment. They are pretty much air tight before they go in the fridge. This looks SO delicious Suzanne! Concord grape jam is the only flavor I ever really liked growing up and I LOVE peanut butter and jelly sandwhiches! Oh, I need to make this…looks so delicious and so easy. I absolutely love the beautiful color too. Thanks Brandi, yes me too, grape jam is and has always been a favorite and brings back memories of my childhood. PB&J sandwiches are the best!! This jam looks perfect! I have never attempted jam but I really want to – it looks so delicious! Thank you Cate, It’s easy and delicious and although it’s easier to pick a jar up in the store this is so much better. It’s wonderful, I hope you can find it in Ireland.It really is such a treat! My daughter Charlotte and I LOVE Concord grapes. I told her I’d make her some jam, but I’m afraid I might be too late! I’m sure it’s delish! It is a bit late but here in NYC there have been nice grapes at the farmers market, maybe the harvest is a bit late this year. So nice, Suzanne! Home-made jam that does not taste too sweet is the best! Thank you, the original recipe called for 6 cups sugar and juice of 1/2 lemon I did 4.5 cups sugar juice of a whole lemon and an apple. It is still sweet but not as sweet as it could be. I think it’s just the right amount of sweetness. Thanks so much Stefano. Thank you it really is good. I can’t stop using it on toast every morning. Unfortunately Concord is not grown in Western Europe. The recipe should work with other varieties as well, right? I am sure it would, concords have a very distinct flavor I think that maybe a black grape would be nice. Thanks Julian. I love jam that is not too sweet! Yours looks perfect! Yum! Thank you, it’s sweet but not as sweet as it could have been. For me it’s just right. I wish I possessed you canning/preserving skills, I would love to have a lot of this jam that would last indefinitely, Thanks Kenley! Oh my!! Thank you for sharing this! I can’t wait to try! It doesn’t get much better than homemade grape jam, thank you so much. I have spied those grapes as well. This is a great way to put those beauties to use. How very clever to use the apple – reading it in the ingredients list I was immediately struck by how it was going to come into play. The end product looks really good and delicious. I can’t leave w/out mentioning that love your swarm of bees mug. So cute! I love concord grapes, thank you I read somewhere that apples are high in pectin especially green I believe so thought it would be a practical addition. Thanks so much, Yes I love my bee mug!! ciao! i do like jams and preserves. this grape jam seems quite easy to make. making it beats buying it. It certainly does beat buying it, grab those concords when you see them. thanks so much. It’s funny how much I don’t like these grapes right off the vine, but jam is like how they are meant to be eaten. Looks delicious. I love the apple approach, too. Thanks Mary Frances,I totally agree either jam or juice is the best way to enjoy concord grapes. I’ve never heard of Concord grapes but this looks fabulous and delicious! Oh my, never heard of them I forget that they are really American in origin. They are quite different from other types of grapes and really wonderful especially in jams, jellies and juice. Thank you so much. The best way to start your day! Delicious jam! I agree nice bread with butter and jam and coffee is the perfect start! Thanks Katerina. I know grape jelly was a staple in America and it really is wonderful, Ha! yes the French and their wine!! The color of concord grapes are just beautiful, the jam is just delicious. One of my favorite things in the morning is toast and jam. Good ol’ grape jam and I’ve never made it! I’ll certainly be giving this recipe a try very soon. Kate, you’ve never made grape jam? I am a bit surprised you make such wonderful jam. This is really one of my all time favorites, it brings out the kid in me. Thank you. My Grandfather had them also and made jam, it brings back memories of childhood, it’s so easy to make and really delicious. Thanks so much. Me too, love all manner of jam, jelly and chutney. Thanks so much. What a beautiful jam, Suzanne! I hadn’t tasted grape jam in many years, and last year when I was trying to decide which jam to get at the farmer’s market the grape was highly recommended. I was skeptical, but when I tasted it was so happy to have it. What a difference in the fresh homemade taste! Thanks for sharing your recipe. Thanks so much Hannah, I am totally in love with grape jam. The flavor is so intense and delicious.